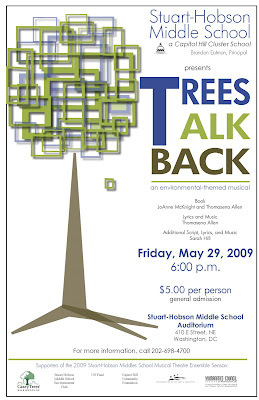 Casey Trees is proud to co-sponsor Stuart-Hobson Middle School's spring musical production - Trees Talk Back in the Stuart-Hobson Auditorium (410 E Street, NE) on Friday, May 29, 2009 at 6:00 p.m. Tickets are $5.00 per person at the door. Ticket sales benefit the school's musical theatre ensemble. Trees Talk Back follows the adventures of Lucille - a feisty teenager - as she learns about the value of protecting the environment from several green leafed friends including Tree-Tree and Pine, Apple and Willow Trees while warding off villains such as Apathy and DJ Heat Wave. Education is key to Casey Trees mission of restoring, enhancing, and protecting the tree canopy of the Nation's Capital. Trees Talk Back provides Casey Trees a unique and fun way to introduce the importance of trees in urban environments to young individuals. When individuals learn why trees should be planted and protected at an early age, they are more likely to continue to care for them throughout their life and share the passion for trees with others. We hope you will join us for Trees Talk Back on Friday, May 29, 2009 at 6:00 p.m.
****School groups may attend the performance for free on Thursday, May 28 (10:30 a.m. and 1:30 p.m.) or Friday, May 29 (10:30 a.m.) by calling 202-698-4700.